Then Queen Srīmālā made three more great vows before the Buddha, saying. The one consistent variable here is a focus on the Buddhadharma; firstly by embracing it; secondly by explaining it to others; and lastly through upholding and protecting it—even if it means sacrificing one’s own life. This proclamation on Srīmālā’s part is an introduction here in the sutra of the One True Dharma Vehicle, which will later be proclaimed as the Tathagatagarbha-Dharmakaya (One Unborn Buddha Mind). One wonders here with Srīmālā’s great acumen whether she is an ordinary woman and bodhisattva-to-be in the first place. This is reminiscent of a similar interpolation that occurred in our Vimalakirti series. As the Tathagata will soon share, she has “practiced the Dharma for a long time”. How long, one wonders? Perhaps, like Vimalakirti, her spirit emanates from a Extra-Supernal Buddha-field, wherein no male-female dichotomy exists. Or, perhaps this is a foreshadowing of her Buddha-gnosis to come in the guise of her future incarnation as Universal Light Tathagata (Tathagata-Arhat-Samyaksambuddha Samantaprabha). The Tathagata is placing her on par with this own Buddha-gnosis, “I, too, often teach…”. This is quite possibly another qualifier in league with our previous interpolation. Anytime Srīmālā is in the presence of the Tathagata, she implores him to let her speak by the “Buddha’s divine power”. This is speculative that she’s channeling the Tathagatas’ own Buddha-gnosis. As you know: She has the same precognitive ability of the Tathagatas—as seen through her own Dharma-eye. This means seeing through the eyes of the Tathagatas themselves, thus channeling their gnosis. Srīmālā said, “To embrace the true Dharma, broadly speaking, means to attain all the infinite Buddha-Dharmas, including the eighty thousand practices. Just as the multicolored clouds at the beginning of a kalpa rain down myriad gems, so the cloud of the good root of embracing the true Dharma rains down immeasurable blessings. “World-Ilonorcd One, to illustrate further, the great flood at the bcginning of a kalpa contains the cause of the billion-world universe, including forty billion different continents. * Ancient Buddhist cosmology holds that in a billion-world universe there are a ten billion Mount Sumerus, each surrounded by four continents. Hence the forty billion continents. In the same way, the embracing of the true Dharma contains the cause of the immeasurablc realm of the Mahayana, and also the miraculous powers of the Bodhisattvas, the various Dharma-doors, and the perfection of the mundane and supramundane joy never before experienced by any god or human. “To illustrate further, the great earth bears four burdens. What are the four? The oceans, the mountain ranges, the grasses and trees, and the sentient beings. The good men and women who embrace the true Dharma can bear four burdens heavier than those borne by the earth. What are the four? (4) to teach the Mahayana to those who seek the Mahayana. As we can discern from these early quarters of the sutra that they are devoted to various Mahayana themes, such as what distinguishes bodhisattvas from practitioners of the two lesser vehicles—the Sravakas and the solitary realizers, the Pratyekabuddhas. These are the four burdens, heavier than those borne by the earth, borne by the good men and women who embrace the true Dharma. “World-Honored One, the good men and women who embrace the true Dharma are able to establish [themselves like] the great earth to bear these four heavy burdens. They become the friends of all sentient beings universally, without need of an invitation. They are the Dharma-mothers of the world, who benefit sentient beings out of pity and great compassion. *Wayman’s footnote extrapolates on the nature of this spiritual guide, or friend. “From early times Buddhism has stressed the importance of relying on a spiritual-guide; the Śri-Mālā expects the utmost reverence for this guide, calling him “World Mother of the Dharma” and promises relying on him a great reward, called ‘infinite source of jewel treasure.’” There’s a Tozen video that highlights this relationship: Exegesis II, Gnosis of the Dharma. It stresses the central-position of the Dharma in one’s life and if you listen carefully well-into the meditation it describes the nature of these friends and Spiritual Fathers and Mothers; it’s available at the end of this blog. Be prepared for a direct, no-nonsense approach. It starts off with a harsh-tone yet one that drives the point home that there is nothing greater in one’s existence than faithfulness to the Dharma. The tone later shifts to a compassionate one as it illustrates the character of these spiritual-friends. “‘To illustrate further, the great earth is the source of the four categories of gems. What are the four? The invaluable gems, those of high value, those of medium value, and those of low value. Similarly, the good men and women who embrace the true Dharma and establish [themselves like] the great earth can cause the sentient beings who meet them to obtain the four great treasures, which are the best of all precious things. What are the four? When sentient beings meet such virtuous friends, they will obtain the good roots leading to birth to humans as humans or gods, to Śrāvakahood, to Pratyekabuddhahood, or to realization of the Unexcelled Vehicle. Sentient beings will obtain these four great treasures after meeting the good men and women who embrace the true Dharma and establish [themselves like] the great earth. “World-Honored One, that which yields the [four] great treasures is the real embracing of the true Dharma. “World-Honored One, regarding the embracing of the true Dharma, I do not mean the true Dharma and the embracing of the true Dharma are different. The true Dharma is to embrace the true Dharma. “World-Honored One, the embracing of the true Dharma is no other than the six pāramitās, and the pāramitās are no other than the embracing of the true Dharma. Why? “For those sentient beings who can best be matured through giving, the good men and women who embrace the true Dharma practice charity, giving even their own lives and limbs. In this way, they bring those sentient beings to maturity in accordance with their inclinations, to establish them firmly in the true Dharma. This is called the pāramitā of giving. “For those sentient beings who can best be matured by discipline, [those who embrace the true Dharma| guard their own six senses; purify their own verbal, bodily, and mental actions; and conduct themselves with dignity. ln this way, they bring those sentient beings to maturity in accordance with their inclinations, to establish them firmly in the true Dharma. This is called the pāramitā of discipline. “For those: sentient beings who can best be matured by patience. [those who embrace the true Dharma] are free of ill will; intend only to beneﬁt; and bear rebukes, scoldings, insults, outrage, slander, libel, annoyance, and harassment with the utmost patience, even without their faces changing color in the slightest. In this way, they bring those sentient beings to maturity in accordance with their inclinations, to establish them firmly in the true Dharma. This is called the pāramitā of patience. “For those sentient beings who can best be matured by vigor,[those who embrace the true Dharma] do not have an indolent or negative mentality, but how great aspiration and supreme vigor, whether walking, standing, sitting, or lying down. In this way, they bring those sentient beings to maturity in accordance with their inclinations, to establish them firmly in the true Dharma. This is called the pāramitā of vigor. “For those sentient beings who can best be matured by meditation, [those who embrace the true Dharma] are not distracted, and achieve right mindfulness and remembrance. In this way, they bring those sentient beings to maturity in accordance with their inclinations, to establish them firmly in the true Dharma. This is called the pāramitā of meditation. “For those sentient beings who can best be matured by wisdom and who ask questions about the Dharma in order to beneﬁt from it, [those who embrace the true Dharma] untiringly explain all doctrines, all sciences, and all techniques, until those sentient beings fully comprehend what is ultimate. In this way, they bring those sentient beings to maturity in accordance with their inclinations, to establish them firmly in the true Dharma. This is called the pāramitā of wisdom. For the Mahayana these six pāramitās must be won before advancing any further on the path to Bodhisattvahood. They provide the spiritual foundation upon which the later stages on the way unfold. “World-Honored One, in referring to those who embrace the true Dharma, l do not mean that they constitute an entity that differs from the embracing of the true Dharma. The good men and women who embrace the true Dharma are the embracing of the true Dharma. Why? “The good men and women who embrace the true Dharma give their Bodies, lives, and possessions for the sake of the true Dharma. By giving their bodies, these people will realize that which transcends the limits of samsara, will be free from old age and sickness, and will attain the Tathāgata’s Dharma-body, which is indestructible, eternal, changeless, ultimately tranquil, and inconceivable. What this particular passage indicates is that such a one forsakes their skandhic-body for the True Light and Dharma-body of the Buddhadharma, being one in spirit with the Dharmakaya of the Tathagatas. This “Spiritual Exchange” has its Bodhi-benefits. “World-Honored one, the good men and women who give their bodies, lives, and possessions in order to embrace the true Dharma will receive the Tathāgata’s prophecy [of their attainment of Buddhahood]. “World-Honored One, when the true Dharma is on the verge of extinction, the monks, nuns, laymen, and laywomen will gather in groups, form factions, and dispute with one another. At that time, the good men and women who, without crookedness or deceit, cherish and embrace the true Dharma will associate with the good faction; those who associate with the good faction will definitely receive the Buddha’s prophecy [of their attainment of enlightenment]. There are always “factions” in the religious life of monks and nuns; this also involves factions within the lay-life as well. It’s a time of great Spiritual-Discernment. 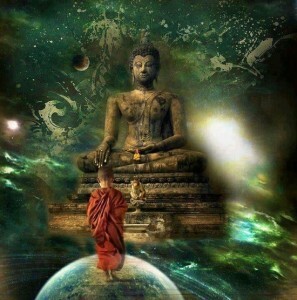 Those who continue, above all else, to embrace the Buddhadharma will side with those who are true Dharma-heirs; they will be assured the positive result of the Buddha’s prophecy of becoming one in THAT Self-Same Enlightened Spirit. The true Dharma-Eye alone guides one through and reveals the True Essence of the Dharma. Then the World-Honored One, having heard Queen Srīmālā explain the great power of embracing the true Dharma, exclaimed, “So it is, so it is! Excellent, Srīmālā! Just as you say, to embrace the true Dharma has tremendous, awesome power. A person will feel great pain or even become severely ill when one of his vulnerable spots is touched even slightly by a strong man. In the same way, Srīmālā, the demon Pāpīyān feels excruciating pain, worry, and distress, and howls and moans with woe when someone embraces even a small portion of the true Dharma. Srīmālā, I have never seen any way to cause that demon worry and distress as effective as embracing the true Dharma, even a small portion of it. “Srīmālā, just as the king of cattle is more beautiful in form and color and larger in size than other cattle, so, Srīmālā, one who practices the Mahayana, even if he embraces only a small portion of the true Dharma, is superior to the Sravakas and Pratyekabuddhas with all their wholesome dharmas. “Srīmālā, Mount Sumeru, the king of mountains, surpasses all other mountains in height, breadth, and beauty. In the same way, Srīmālā, a novice in the Mahayana who, in order to benefit others, embraces the true Dharma without regard for his life or limb is superior to a person who has long been abiding in the Mahayana, but who is always concerned with his body and life, in spite of all his good roots. “Therefore, Srīmālā, you should reveal, demonstrate, and teach the embracing of the true Dharma to all sentient beings. This entry was posted in The Lion's Roar of Queen Śrīmālā and tagged Dharma, Dharma-eye, Gnosis of the Dharma, Mahayana, pāramitā, Six Paramitas, women. Bookmark the permalink.